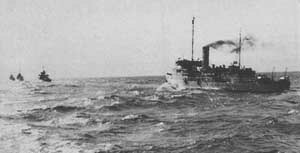 During World War One, the United Kingdom built many Aberdare class minesweepers. Even after the war had finished, production continued. On 10 November 1919, HMS Wexford, was launched from the William Simons shipyard in the UK for the Royal Navy. She had a displacement of 800 tons, a length of 231 feet (70.4 m), a width of 28.5 feet (8.68 m) and a speed of 16 knots Of course, the new ship never served with the Royal Navy during the War and may not have even really served after. In 1921 representatives of the Brisbane Tug and Steamship Co. Ltd travelled to Montrose in the UK to look at surplus and paid off vessels. They selected HMS Wexford and in December 1921 it was sold to the Brisbane Tug and Steamship Co. Ltd and brought to Australia. In Brisbane, it was overhauled and made capable of carrying 1,524 passengers and renamed Doomba. 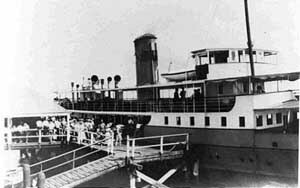 Its new role was as an excursion boat to Stradboke Island across Moreton Bay. The company also used another ship. In 1923 the ownership changed to the Doomba Shipping Company. This may have been the same company and just a change of name but from other information it might also have been a totally separate company. It continued to be used in the same role as a day trip boat across Moreton Bay. In 1928 the Doomba was withdrawn from regular service as the clientele had dropped off due to the increasing number of cars now owned by the general public. She was now only used when the bookings required a second vessel. In 1936 the Doomba was laid up permanently. In 1937 she was resold back to the Brisbane Tug and Steamship Co. Ltd, confirming that the previous owner may have been a different company. On 3 September 1939, the Doomba was one of the first civilian vessels requisitioned by the Royal Australian Navy. 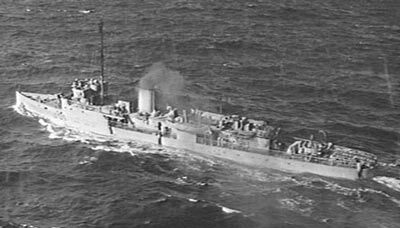 The ship was renamed HMAS Doomba and had one 4 inch gun installed, two 20 mm heavy guns, four machine-guns and two series of depth charge launchers. 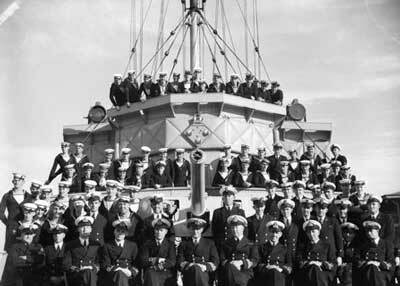 Commissioned as N01 on 25 September 1939, the Doomba served the war, first as a minesweeper around the Wilsons Prom, Cape Otway area in South-Eastern Victoria and along the the East Coast of Australia, that is New South Wales. In 1940 she was purchased outright by the RAN for £12,000. During the war, the ship was affectionally known as "Smoky Joe" due to the fact that she emitted huge amounts of black smoke when underway. In late 1941 she swept a channel off Wilsons Prom, primarily working 19 to 20 kilometres west of the point. During this time a huge storm hit the area and HMAS Doomba was seen going backwards in Waterloo Bay being pushed by the wind, dragging her anchor and with her engine flat out trying to make way. Around Christmas 1941 she moved back to Sydney. 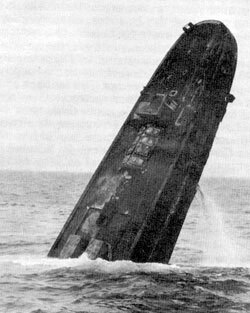 Here she was converted for submarine detection. 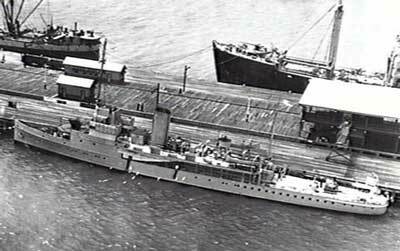 On 31 May 1942, two Japanese midget submarines entered Sydney Harbour and attempted to sink the heavy cruiser USS Chicago which was anchored off Darling Point (they failed, sinking instead the converted ferry, HMAS Kuttabul, which was being used as accommodation for troops. 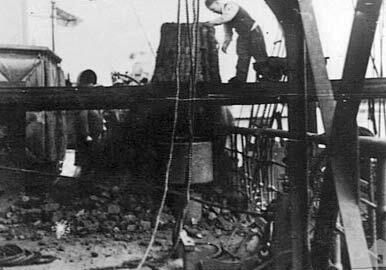 The explosion and sinking killed 19 Australian and 2 British seamen. Early the next morning another midget submarine entered the Harbour (it was delayed due, it is thought, to problems with its buoyancy) and preceeded up towards the Sydney Harbour Bridge. At 3.50 am it was seen near Neutral Bay and at about 4.50 am HMAS Doomba reported seeing the submarine off Robertsons Point. The submarine was later sunk in Taylors Bay, to the east of Taronga Zoo. It was later raised, together with the first submarine and the composite submarine is now on display at the Australian War Museum in Canberra. A third submarine was never heard of again. 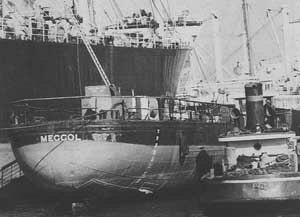 On 11 June 1942, Convoy CO2 (CO was code for journeys from Newcastle to Melbourne) formed off the coastline off Newcastle, New South Wales. 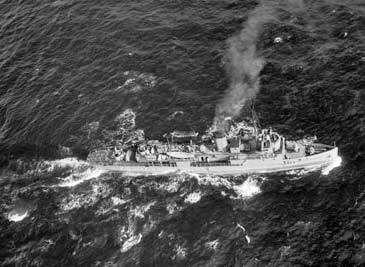 There were eight ships in the convoy escorted by USS Perkins and HMAS Whyalla. One of the ships was the Panamanian cargo ship SS Guatemala (also spelt as Gautamala in one reference) which was under charter to the Commonwealth Government. The Guatemala was travelling from Newcastle to Whyalla in the convoy with 4,200 tons of coke for the new shipyard. At about 0115 the next day (one reference says 11 June), the Guatemala was at the end of the convoy making seven or eight knots south when a torpedo fired from a Japanese submarine, the I-21, hit her adjacent to hold one (I have also read that it was the I-24). The I-21 was involved in the attack on Sydney Harbour 12 days earlier, its float plane being used to scout the Harbour for possible targets. There were no casualties and the ship did not sink till 0230. 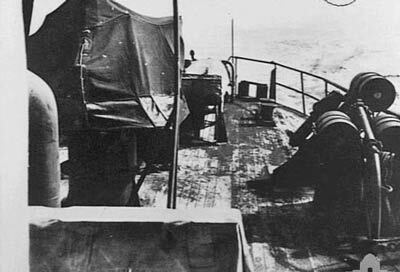 The crew had got into the lifeboats as soon as the ship had been torpedoed but waited alongside till their ship disappeared under the waves. 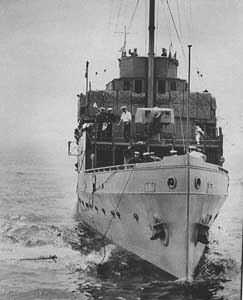 Later that morning, HMAS Doomba rescued the 51 crew and took them to Sydney. I am not sure where this event occurred, but it was off the NSW coastline, probably off Sydney due to the fact that the Doomba was based in Sydney and she appears to have arrived on the scene fairly quickly. 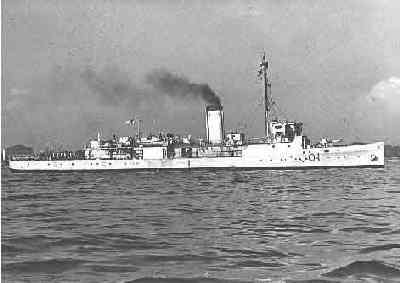 From June 1942 heavier armament was added and her role changed to an anti-submarine vessel/patrol boat (J01). She was based in Sydney and had a complement of 74 crew. In 1944 the Doomba's role changed again. She became a training vessel and also did minesweeping duties. The Doomba served until it was paid off on 13 March 1946. On 3 February 1947 it was sold to Penguin Ltd. This company was presumably the same company that purchased the wrecks of MV Malabar in 1931 and SS Minmi in 1937. They were shipbreakers and apparently they removed the superstructure and engines. The hulk was sold (perhaps in 1951) to Meggitt Ltd, vegetable oil merchants and renamed Meggol. From 1950 or 1951 to 1969 or 1970 the hulk was used as a mobile and then stationary oil barge. I am not sure if the ownership stayed the same or what type of oil was carried. It is possible that she was used to offload vegetable oil from overseas ships and then transport it to a place where Meggitt Ltd could unload it into their factory. Is it refuelling her or offloading a load of vegetable oil? One source (the Australian Government Environment Web Site) says that it was sold straight away for use as an oil barge on Sydney Harbour and Parramatta River. In any case, in 1970 she was again laid up and sold to the breakers. The rusty hulk of the Meggol lay abandoned in Homebush Bay, Sydney, a short distance from the State Brickworks. There may have been some salvage work done on her during this time. 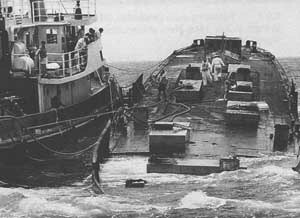 On 8 December 1976 she was refloated and towed out of Sydney where she was sunk off Long Reef at 1.12pm. The same source above states that it was scuttled on 9 December 1976. Sunk as the second vessel for the artifical reef, the Meggol now sits upright on a sandy bottom of 49 metres. The deck is 43 metres down and not much protrudes above the deck. Photographs of the Meggol when it was HMAS Doomba show it has obviously been substantially modified since its days as a warship, although the hull and deck appear to be similar (see phot above). The vessel is sitting upright and lies north-south with the bow only 20 metres or so from the Manly Ferry Dee Why. In good visibility it is possible to see the old ferry from the bow and you can even swim over to it when it is like that. To the south of the stern of the Meggol lies another wreck, although not of a ship. About 20 metres away is a ferry pontoon which sits upright on the sand, looking like a huge artillery piece. The Meggol has suffered greatly in the time since it was sunk and in 1993 when I first dived it, it was in far worse condition relative to wrecks such as the Dee Why, the Coolooli and the Bellubera. Even then the Meggol's hull and deck were rusting through quite badly and in many places it was possible to look though to the inside. In some places it was almost possible to manoeuvre inside. It is even worse now (2004). See the comments below. 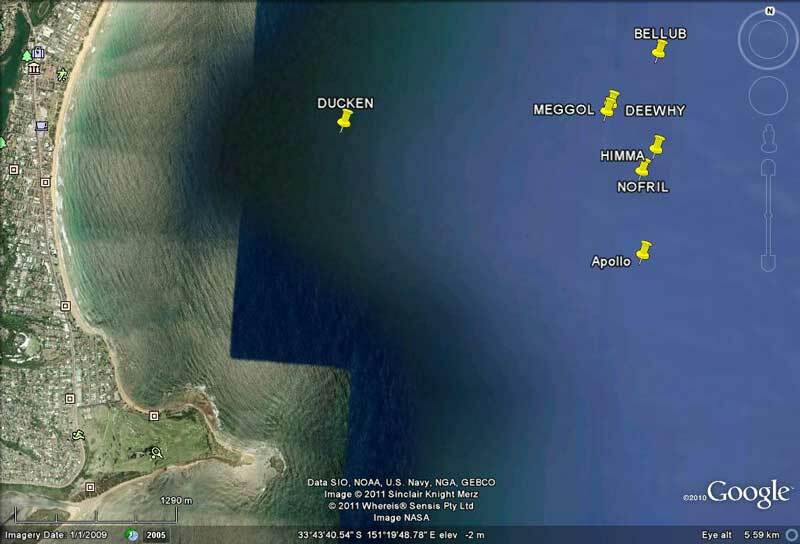 The GPS reading for the wreck is 33° 43' 04" S and 151° 20' 45" E. Note all GPS Readings on this site use Map datum AUS66 or AGD66 or similar. Make sure you are using the same one. See my GPS Page for more details. To locate the Meggol, use the attached marks as described in the next few sentences. For the north-western mark, line the Baha'i Temple mark over the second house to the right of the pine trees. For the western mark, have the water tower over the right hand side of the northern-most block of units. See the above diagrams for more details. On the depth sounder, the depth used to rise from 49 metres up to 43 metres but I suspect that it is even deeper now. If it comes up to 40 metres you are on the Dee Why. As soon as you are over the wreck turn to the north and run along the wreck. Making sure that you are still over the wreck, drop your anchor and cut your motor. After descending to the wreck, secure the anchor line to the railing, one of the bollards or inside anywhere you can. Straight away you will see that the wreck is totally collapsed. Follow one side of the vessel to the north until you come to the bow. Drop to the sand (49 m) and look at the deterioration of the hull. When you reach the bow, if the visibility is very good, you may be able to see the Dee Why to the north. In March 2004 there is a rope running across to the ferry. In 1993 the deck was intact but now it has collapsed almost totally. 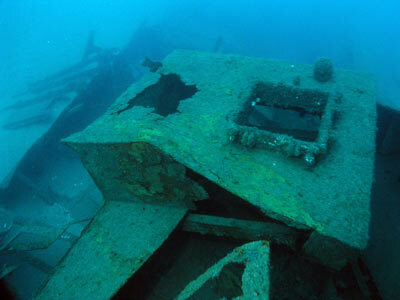 The wreck used to stand upright and was bascially still in the shape of a ship. The hull from the bow back to the first hold has collapsed to the starboard and is almost level with the sand at the rearmost section. Return to what was the wreck's deck and follow it back to the south and examine the many holes. Below deck, the oil compartments used to drop away below the level of the sand, although some had considerable amounts of sand in them. Now the deck sits either right on or only a few metres above the sand. Towards the stern you used to find a doorway and ladder/stairs going down to a large hold. Further along there was a skylight hatch which had two hatches missing. You could enter into the hold here quite safely as there was a considerable amount of light entering through the hatches, the stairway and a number of large holes in the hull. 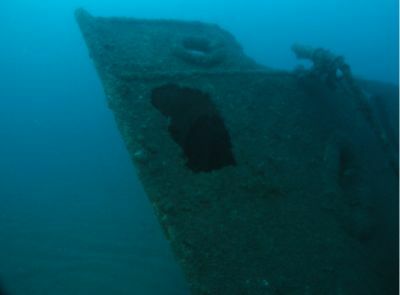 However, I did not dive this section fo the wreck in March 2004 so I do not know if it is still intact as it used to be. If it is, do not enter any of the compartments leading off from this one without proper penetration diving procedures. Behind the hold there are the remains of the steering compartment. Again, if the viz is very good you should be able to see the ferry pontoon to the south. By now you will have taken 15 minutes or so and on a single tank you will need to return to the anchor to ascend. On twins, a little longer will be able to be spent here before returning to the anchor. Throw the anchor on the sand (making sure it will not connect with the ferry pontoon) and ascend. This is not a dive for the inexperienced. You should be trained to dive deep and must have considerable deep diving experience to dive the Meggol. Preferably you will also be accompanied by a diver with knowledge of diving here. I would always recommend that any dive deeper than 40 metres should be done on a minimum of a main tank with a pony bottle backup.